This is the fourth and final installment of the ‘Return of the King’ Sermon series blog posts. Q: [From Matthew 25:31-46] As Christians, and with realities that people don’t know Christ and are ultimately going to hell, how can we rationalise having time to ourselves, just relaxing having fun? I take it that if we are faithful then there will be fruit (no matter how small). Some issues: we land in some hot water if we focus too much on the fruit aspect. While visible fruit can be a helpful way to gauge things at times, if we focus too much on the fruit then we can turn into a bunch of neurotic people who start doubting whether we’re even saved. And while the bible encourages introspection of sorts, it doesn’t encourage that kind of of crippling of ourselves. Thanks for your question! It’s a helpful one because you raise some very important issues. Does the return of Christ matter? That’s the gist of a question posed to me. So, what is the big deal with Jesus return? Why should I remember it? Or even long for it? Well, here are two briefs reasons why it’s worth keeping his return in the forefront of our minds and hearts. 1. It’s part of the whole story. 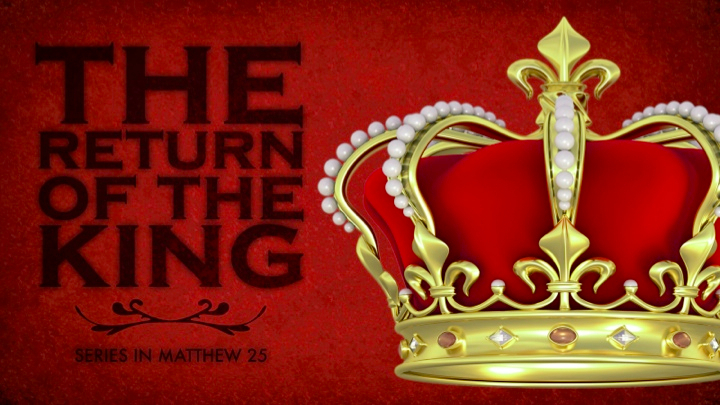 The Return of the King – New Sermon Series – this Sunday! What do we do with the delay in Christ’s return? Delays cause issues. So what do we do with the delay in Christ’s return? Jesus has given us Matthew 24 and 25 (and bunches of other parts of his Scripture) as a way to help us live in light of his return. We’ll be looking at the three parables (although the last one isn’t a parable) from Matthew 25 and seeing how it helps us live as Christ’s people here as we wait for the King to return. Over the next 3 Sunday’s we’ll be doing just that.